First a clarification – the free in this article stands for "free as in free beer". I am not talking about open source or GNU software, but rather software which you can download without paying a cent (legally of course). I have two computers at home and on the main desktop I have Windows XP installed. I bought Windows XP since I want to try out latest Windows PC games. I also regularly use a couple of free software packages available on Windows platform. For programming and other stuff I use Mac OS X on my laptop. Following is a list of 9 free Windows based software that I use on a daily basis. Some of these software packages are so good that you may not be find a good alternative for Linux based operating systems such as Ubuntu and Fedora. Also please note that many of these software packages are NOT open source. If you don’t have a license of Windows XP, you can get most of these software packages running under a Linux distribution using Wine emulator software. Wine is an open source implementation of Windows API and hence using Wine you can run Windows programs on other platforms. Unfortunately I haven’t been able to run Windows Live Writer (the best of the lot) on Wine. Better still some of these software packages are available on other platforms (GIMP for example). 1. 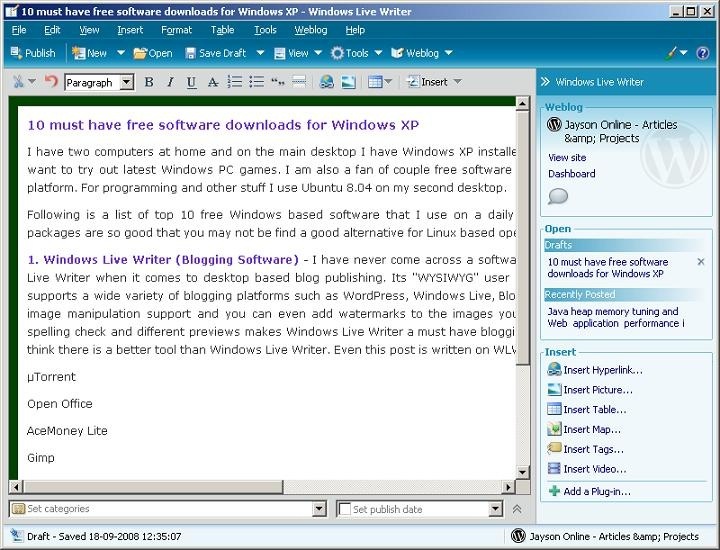 Windows Live Writer (Blogging Software) – I have never come across a software which is as good as Windows Live Writer when it comes to desktop based blog publishing. Its "WYSIWYG" user interface is simply superb and it supports a wide variety of blogging platforms such as WordPress, Windows Live, Blogger and TypePad. It has built in image manipulation support and you can even add watermarks to the images you upload. For specific blogging platforms, you can download plugins to add more features to WLW installation. Built in video support, spelling check and different preview modes makes Windows Live Writer a must have blogging software. 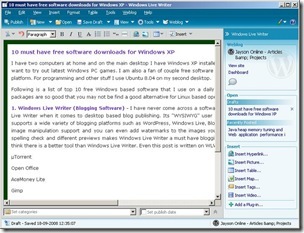 For blogging I don’t think there is a better tool than Windows Live Writer. Even this post is written on WLW! 2. 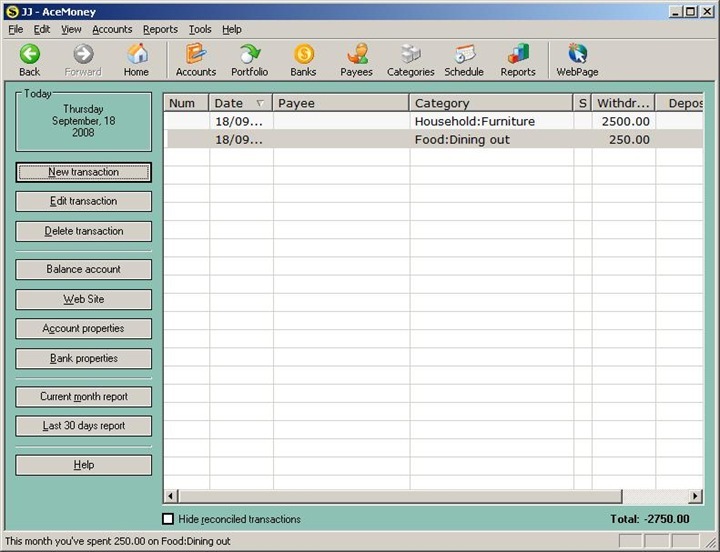 AceMoney Lite (Personal Finance Manager Software) – AceMoney Lite is a very simple personal finance manager software to keep track of your money. I use it every month to see what are my major expense categories and to see whether expenses are within my means. Its default expense/income categories are good enough for me and the software itself is easy to use. AceMoney also provides a good set of reports with drill down feature. 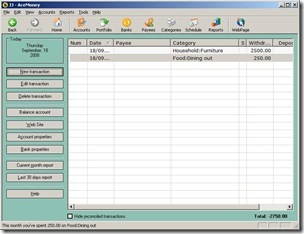 You can use it to analyze your monthly budget. You can also password protect your financial information. The Lite version supports only one account and for personal use I don’t find it a problem. A work around to this problem is to use multiple database files! 3. µTorrent (Torrent Download Software) – The best way to download large files these days is to use torrents. utorrent is a very lightweight and modern BitTorrent client available on Windows platform. The user interface is very functional in nature and you can fine tune your torrent downloads using a number of parameters. To unlock the full potential of torrents, you might have to use port forwarding on your wireless router and utorrent can detect this. utorrent also supports bandwidth throttling for uploads and download. 4. Open Office (Word Processing Software) – Microsoft Office is a very good word processing package. But why should you pay for it when you can get almost the same functionality out of the free Open Office suite? Whether you want to edit a word document or to create a slide show, Open Office is the ideal software. The best thing is that it is compatible with MS Office and can open documents created by MS Office. However if you are an advanced user of MS Office, you might find Open Office not suitable for your work. 5. Gimp (Image Manipulation Software) – For most of the simple image editing I use Windows’ built in Paint software. But for any good image editing operation, you need a professional tool. The best free tool available is Gimp and it has almost every image editing feature you need. The only downside is that it takes a bit of time to get used to the tool. 6. Windows Movie Maker (Video Editing Software) – Photography is one of my hobbies and many times I also take short movie clips. 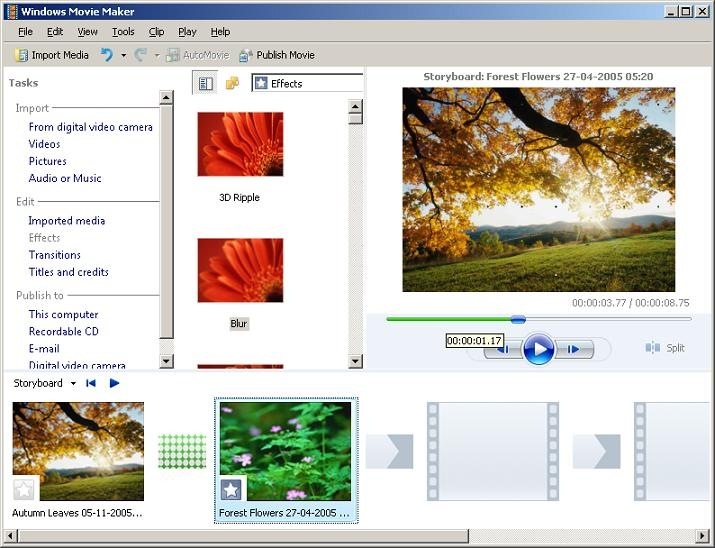 Windows Movie Maker is an ideal tool for amateur type video editing tasks. For example, I can quickly convert a number of photographs to a movie with titles and background music! 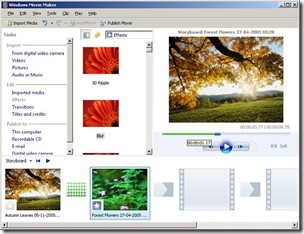 Windows Movie Maker also supports various video transition effects and video editing effects. Give Movie Maker a try and you will be amazed at its ability to create professional looking video compilations in a short time! 7. Pidgin (All in One Instant Messenger Software) - I have multiple instant messenger accounts and hence an all in one instant messenger is convenient than using an array of different instant messenger software packages. Pidgin is the best tool for this and supports Yahoo messenger, Live messenger and Google Talk. It can even connect to IRC networks! What more do you want? Another good IRC client is MiRC. However it has a single user license fee of $20. If you are big fan of IRC like me, you should get it. 8. Free Download Manager (File Download Manager Software) – Not all downloads are available as torrents. Most of the small software packages are still available as direct downloads and a download manager is a must have item. Using multiple threads Free Download Manager squeezes the last bit of your broadband bandwidth to accelerate downloads. It can also stop and resume downloads if the server supports the feature. 9. Google Chrome (Backup Browser) - I like Internet Explorer and most of the time I use IE for browsing. But once in a while I come across Web sites that works only on a "proper standard browser". Hence every Windows user should have Google Chrome installed as a backup browser! Also whenever I want to access "dubious" looking sites, I use Chrome or Firefox since majority of trojans and malwares target Internet Explorer vulnerabilities. Google Chrome is extremely lightweight and by default it provides maximum window space for content. I use IE, Firefox and Chrome regularly as part of Web application testing and I find Google Chrome distinctly more useful than others. I also find IE8 better to use than Firefox 3! Also please note that as of IE8, Internet Explorer is very reliable. However you should ensure that auto update of Windows XP is enabled so that any browser vulnerabilities are patched as soon as detected by Microsoft. There are many more Windows applications that I use regularly. Some of these include VirtualBox, TrueCrypt, Wampserver, Eclipse IDE, TweetDeck, MobiPocket, iTunes and VLC Player.